Another beautiful beach, at Nalauwaki Bay, Yasawas. Scorpio is at anchor in the left corner background under the hills. After a couple of days in Savu Savu we started sailing towards Viti Levu, the largest island of Fiji, stopping at some islands on the way in the Koro Sea and in Bligh Water. The latter is named after Captain William Bligh, the dethroned commander of Bounty, who passed through in the rowing boat he and those of the crew who were loyal to him were given after the mutiny. When passing between Vanua Levu and Viti Levu they narrowly escaped ending up in a pot of the Fiji cannibals. 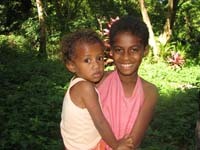 Today the cannibals are long gone, but indigenous Fijians live in villages along the rivers and coasts. Fiji is considered to be part of Melanesia, but it is a kind of transitional zone, where people and customs show traces of both Polynesia and Melanesia. Like Polynesians they have hereditary chiefs and when we anchor outside a village we are expected to visit the chief to get permission to stay. Fijians are very tradition oriented, and one of the most important traditions is the yanggona ceremony, which is performed with utmost gravity in accordance with a sacramental ritual to mark special occasions, such as births, marriages, official visits, etc. In short the idea is to share a bowl of kava, a tranquilizing non-alcoholic drink that numbs the tongue and lips, that is made from the kava root, a pepper plant. When we arrive in a village we ask the first person we meet to take us to the chief. We then present the chief a bundle of kava root along with a short speech explaining our visit, a custom known as sevu sevu. The sevu sevu is received by the chief and acknowledged with a short speech of acceptance. Usually the ceremony ends at this point without getting to the actual preparation of the beverage and the drinking ceremony. 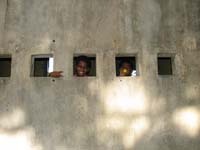 After that, we are free to be at home in the village and the surrounding areas, including the water and the beaches and reefs. This procedure is repeated in every new village where you arrive. 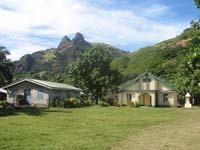 Abbreviated versions of the full yanggona ceremony are put on for tourists at hotels and resorts all over the country, but the villagers have simplified drinking sessions several times a week and social kava grogging is an important form of entertainment and a way of structuring friendship. Even though the drink looks like grey dishwater and does not, in our opinion, taste any good, you need to finish at least the first cup or your manners will be considered bad. One of the islands in the Koro sea is Makogai, where they once had a leper colony but the hospital buildings are now in ruins. There is now an experimental farm owned by the Department of Agriculture, where they try to breed sea turtles and giant clams, which are endangered. The photos of the children above are all from that location. There are also the ruins of Fiji's first cinema with the walls of the bunker-like projector room fairly intact. The Fiji weather was a slight disappointment, with quite a lot of over cast and strong, gusty winds. Because of the thousands of reefs and almost non existent navigational markers and lack of fixing points you have to do a lot of eyeball navigation, which requires reasonably fair weather. But we had almost all the waters and anchorages for ourselves - during 10 days we saw only one other sailing vessel and some of the settlements are so poor that they do not have any boats at all! After visiting some additional islands, such as Naingani, we reached the shores of Viti Levu, which we circled anti clock wise to Lautoka, Fiji's second city after the capital Suva. When reaching the towns and bigger settlements one realizes that nowadays more than half of the population of Fiji is of Indian origin. They descend from indentured laborers, who started to arrive around 1880. 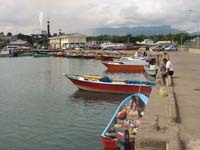 Unlike the village-oriented Fijians, the majority of Indians live in the towns and they dominate the middle level business. Getting ready to meet the village chief Not Bora Bora, but Waya island. 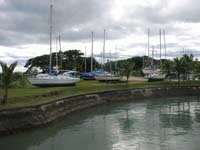 Lautoka is a big noisy place, and we quickly raised anchor and sailed to the two island groups to the west of Viti Levu, called the Mamanucas and the Yasawas. On the way we inspected two marinas as potential places to leave Scorpio during our upcoming vacation in Finland. The first one was Vuda Marina at Vuda Point on the Viti Levu "mainland" and the other Musket Cove on the island Malolo Lailai at the southern end of the Mamanucas island chain. In Vuda Marina we met Raimo, who was born in Finland but has lived most of his life in Sweden. 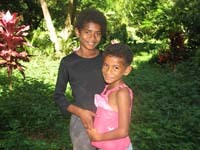 He is married to Aliti, a Fijian preacher, and they cruise among the islands aboard Raimo's sailing vessel Noomi, spreading the Gospel. From Malolo we sailed north along the island chain. Many of these islands have a resort and almost all have gorgeous beaches. Cruising by sailing vessel is not, however, very easy because anchoring is in very deep waters, often 20 metres or more and close to coral reefs with little or no all around protection from winds and waves. 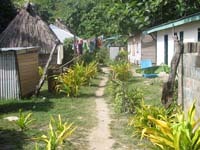 We particularly liked Waya island, where we really enjoyed the areas and people around Naluawaki village. At this point we encountered several days of disgusting weather. Therefore we ran out of time and the rest of the islands to the north remained unvisited. 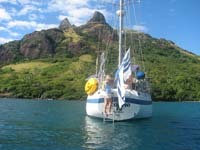 From the Yasawas we sailed back to Viti Levu where we had booked a berth for Scorpio in Vunda Marina. It was time for the crew to fly to Finland for a short vacation in the Scandinavian summer. 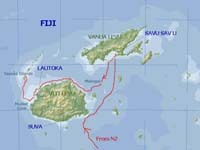 When we return to Fiji at the end of August we will set sail for Vanuatu. See these photos in a manual slide show (opens in new window).